While the economy overall is producing less greenhouse gases, oil sands will be increasing emissions substantially. Envrionment Canada released its report on emission trends showing that total emissions are declining across large parts of the economy, even while Canada's GDP has continued to rise. "Canada’s total greenhouse gas emissions in 2010 were 692 Mt, essentially unchanged from 2009 levels (a 0.25% increase). This means that between 2009 and 2010, Canada’s emissions remained steady despite economic growth of 3.2%," writes the authors of the report. The reason for the change? Economic growth is becoming decoupled from emission increases. The service side of the economy is growing, which is less energy intensive. Also energy production, manufacturing and transportation have all become more efficient. "According to the report, Canada is now half way to its target of reducing total greenhouse gas emissions by 17 percent from 2005 levels by 2020," writes the Minister of the Environment, Peter Kent. "Last year, we were one-quarter of the way to our goal. And now we’re half way there. This shows the significant progress we are making in meeting our Copenhagen commitment." However, oil sands' emission are expected to grow substantially between 2005 and 2020. Oil sands mining will double emissions, and in situ will increase five times. Alberta's overall emissions will increase by 23% between 2005 and 2020. Mining, one of the emission-intensive industries along with cement, chemicals and pulp and paper, are expected to grow slightly, emitting six MT in 2005 and rising to eight in 2020. 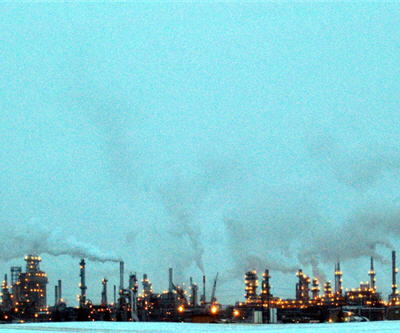 Oil sands' big contribution to future emissions' growth. 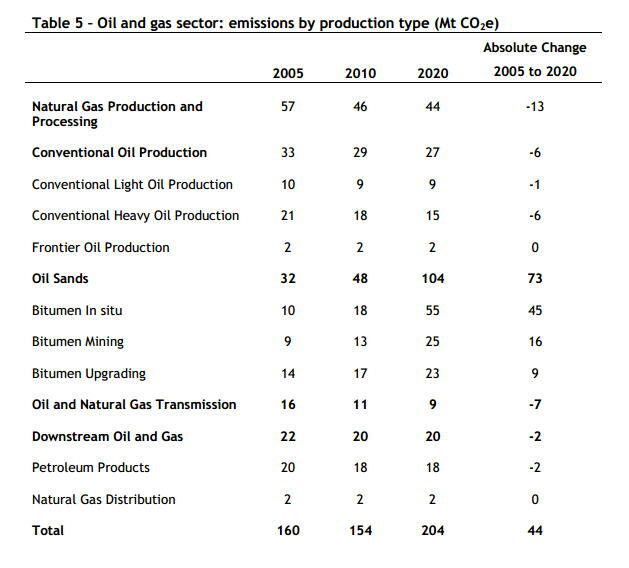 Table from Canada's Emission Trends.